Shalom Aleichem! I have the pleasure of inviting you to join a new and exciting Yahoo group dedicated to the Torah, Negina and Heritage of Modzitz - a group called modzitzers (invitation link below). This group/site is dedicated to the memory of the Modzitzer Rebbe ztvk"l,who was nistalek (passed away) last week. Our goal is to provide you with a full range of the Torah, Negina/Music, Heritage and News of Modzitz, past and present. Due to the storage limitations of Yahoo Groups, as well as the present aveilus [mourning] we are enduring in Modzitz, it will take some time before we are able to have a full selection of niggunim. We hope that you enjoy the group, and continue to visit as we add more material regularly. There are some automatic messages that will be sent to you once you join to guide you how to use the group most effectively. All the links in this post [except my e-mail], including this one, will take you to the home page, where you can "Join this Group." Looking forward to meeting you there! 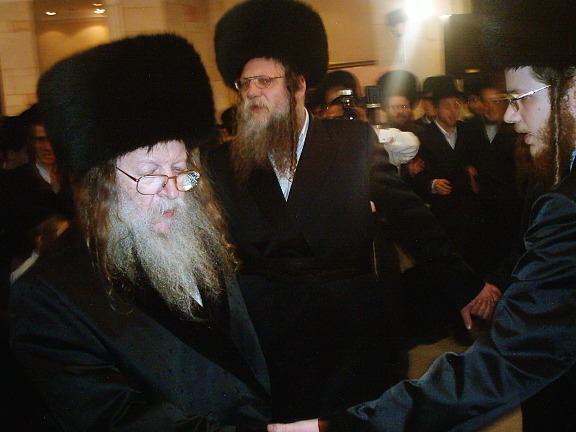 Yitz and his son at the Levaya of the Modzitzer Rebbe ZT"L, last Friday in Yerushalayim. Yitz is the fourth person back from the front of the second row from the left; his son, without a hat, is directly behind him. The stories are beginning to come out about the greatness of the Modzitzer Rebbe ZT"L, who left us this past Friday; and about the greatness of the Modzitz niggunim and its Torah. This Shabbos were are looking forward to a Shabbos "Hiskashrus", forging a renewed connection to the new Modzitzer Rebbe Shlita. You will be hearing more about this later on. For now, Modzitz is undergoing a revamping of its website, and hopefully very soon you will be able to find the up-to-the-minute news of Beis Modzitz, in both Israel and abroad, easily on the Internet. May Hashem wipe the tears from our faces, as the Shiva period has ended; and may He give the new Rebbe Shlita the koach [strength] to lead his flock in the same great way as his predecessors. The following piece is a guest posting from my good friend, Yosef Ben Shlomo Hakohen, who has an excellent website, Hazon - Our Universal Vision. I did some light editing on it, and made some small additions, mostly from the article upon which it is based. A “cantor” is the one who leads the congregation in prayer. (The Hebrew term is chazzan.) According to tradition, the cantor should be a G-d-revering person of good character who is familiar with the liturgy and understands the basic meaning of the prayers. In addition, he should also have a pleasant voice. The goal of a good cantor is to chant the prayers in a way which stirs the souls of the members of the congregation so that they can pray with greater intensity and devotion. In my grandparents’ generation, there was a famous and beloved cantor - Cantor Yossele Rosenblatt - who, like my grandparents, immigrated to New York City [in 1912 – yitz]. He was internationally known and respected, and many Gentiles would attend his public concerts. His concerts were also reviewed in The New York Times and other leading American newspapers. Although this was an age when many Jewish immigrants were abandoning their traditional Torah way of life in order to assimilate into the American culture, this was not the case with Yossele Rosenblatt. Despite his success and fame, he continued to fulfill the Torah's path of mitzvos, and even when he gave concerts to the general public, which included some songs from other cultures, he would wear his large black yarmulke and frock coat. Yossele was born in 1882 in the Ukranian Jewish town “Belaya Tserkov.” His father, a Rizhiner Chassid who frequented the court of the Sadigora Rebbe, was himself a cantor, and the Chassidic spirit and music was a major influence on Yossele's life. As David Olivestone writes in Jewish Action: “He possessed a magnificent tenor voice of great beauty and extraordinary range, with a remarkably agile falsetto. In addition, he had perfect pitch and could read the most difficult musical score at sight.” Both his congregants and his concert audiences loved the sweet timbre of his voice, and his singing included the traditional Jewish “sob” which evoked the emotions of his listeners. According to an old Jewish saying, “Words that come from the heart enter the heart,” and this was also true with the songs of Yosselle Rosenblatt. And much of what he sang, and later recorded, was his own composition, significantly influenced in its tunefulness by his Chassidic background. In 1917, he went on a concert tour of thirty cities in order to help raise funds for the many Jews who had suffered greatly during World War I. (Due to the anti-Semitic atmosphere in Russia and Eastern Europe, the Jews living in these countries had experienced violent attacks known as “pogroms.” They were uprooted from their homes, and often left homeless.) His appearance in Chicago was a turning point in his career, and it also presented him with a great challenge. An invited guest at the Chicago concert was Cleofonte Campanini, general director of the Chicago Opera, who was so struck by Rosenblatt's artistic ability that he visited him immediately after the concert and offered him $1,000 per performance - a very high fee in those days - if he would sing the role of Eleazar in Halevy's opera, La Juive. Campanini carefully outlined a contract with terms that he believed would ensure that Rosenblatt would not have to compromise on his traditional Jewish way of life. For example, he could retain his beard; he would not have to appear on Shabbos and the Jewish Festivals; and kosher food would be obtained for him. The offer and its refusal caused a storm, with reporters from both the general and Jewish media vying to understand how Yossele Rosenblatt could turn down such an offer. After all, this was “America” - the land where even new immigrants could achieve fame and fortune. In the “old country,” a Jew could be poor and unknown and still be greatly respected for his Torah knowledge and/or good deeds, but in the new country of America, people were primarily judged according to their financial status and fame. It was therefore difficult for many people to understand why Rosenblatt gave up an opportunity which could lead him to become a wealthy and famous opera star! In an interview with the trade journal Musical America (June 22, 1918), Rosenblatt admitted: “The cantor of the past and the opera star of the future waged a fierce struggle within me.” He added that “suddenly a voice whispered in my ear, ‘Yossele, don't do it!’ ” The “cantor” within his soul overcame the desire to become a famous opera singer. Cantor Yossele Rosenblatt was especially dedicated to the mitzva of tzedaka – the sharing of our resources with those in need; thus, he gave away much of his earnings to needy individuals and various tzedaka causes. In addition, he invested in a new Yiddish newspaper which was designed to bring American Jews back to Torah. After a few years, the newspaper went bankrupt and could no longer be published. His great generosity caused Rosenblatt to go into debt, and he did concert tours in order to pay his creditors. In 1933, he was offered a movie role that he could accept in good conscience. The proposed movie, Dream of my People, would show the Jews of America the Holy Land with its sacred sites and newly built cities and towns. In this movie, Cantor Yossele Rosenblatt would sing his own compositions at the biblical sites relevant to the words of those prayers. For Yossele, this was an opportunity to visit the Land of Israel - the realization of a lifelong dream of his own. While he was in the Land, he gave concerts, and he participated in the services of various synagogues. He hoped to later go on a European concert tour, in order to raise funds which would enable him and his family to settle in the Land of Israel. On Shabbos, June 17, 1933, he led a “farewell” service held at the Hurva Synagogue in Jerusalem. The next day, after filming a scene at the Dead Sea, Yossele suffered a sudden heart attack. Within a short while, his soul left this world. He was buried on the Mount of Olives, and over 5,000 Jews came to the levaya - the honoring and escorting of the soul as it begins its journey to the World to Come. (Scenes from this moving event were later included in the movie.) 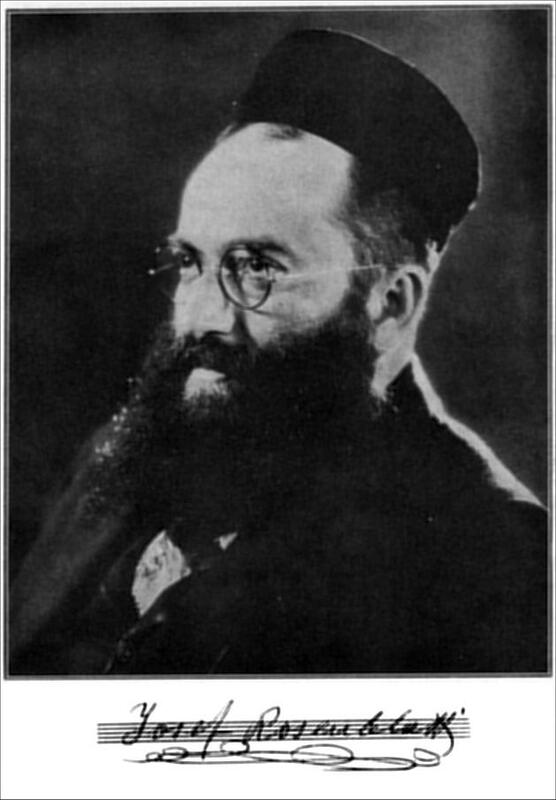 The eulogy was given by Rabbi Avraham Isaac Kook, one of the great sages of that era. While he was in the Land, Yossele spent Shabbos afternoons with Rav Kook. Over seven decades later, Yossele Rosenblatt’s impact continues to be felt. Many of his compositions have become staples in the repetoires of Ashkenazic cantors and are regularly sung in synagogue services and concerts. His recordings have been repeatedly reissued, most recently on CD, and one may find some samples on Jewish music sites on the web [see below – yitz]. There is also a recording of the songs that he sang in the Land of Israel. In summary, among the chazzanim who followed him, there has been no one who has captured the hearts of the public quite the way he did. In shul, he gave voice to the deepest feelings and yearnings of those who entrusted him as their shaliach tzibbur. On the concert stage and in the theater, he would bring down the house night after night, impressing his audiences as much with his Yiddishkeit as with his artistry. In both settings, Yossele Rosenblatt created a Kiddush Hashem every time he sang. We, the Jewish people, still remember our beloved Yossele, for his soul expressed the song of our people – a song which is destined to be heard by the entire world. 3. Shir HaMa'alos - or here. 4. A video film about Yossele [at present, it appears that this video is "down". Try this page instead - the video should be in the upper left of the page]. 5. Notations of 26 pieces, two of them with Midi files. 8. AMAZING VIDEO DOWNLOAD! At this link, someone has uploaded a video called "yossla". It's 8 minutes long, black & white of course, with amazing footage of him singing "Yevarech es Beis Yisrael," with some very rare footage of the Kosel HaMa'aravi [the Western Wall] in Yerushalayim. But hurry, it could expire! Readers are invited to post more links in the Comments section, I'll try to post them all! 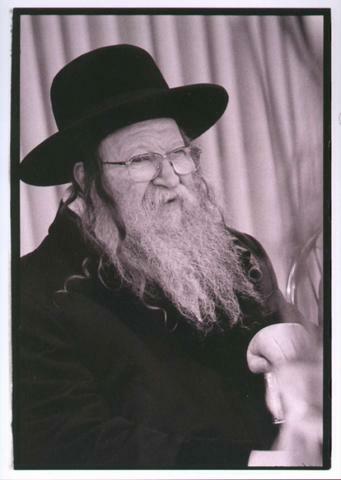 We regret to announce the passing of the Modzitzer Rebbe ZTUK"L, who was niftar overnight [Thursday] in Bnei Brak. The Levaya [funeral] took place earlier today, leaving the Rebbe's Beis Medrash in Bnei Brak, went on to Yerushalayim, at Kikar Shabbos, and then to Har HaZeisim [Mount of Olives]. Many Modzitzer Chassidim were at the Ma'ayanei HaYeshua Hospital yesterday in Bnei Brak to spend the final moments with the Rebbe ZT"L. However, in an almost miraculous fashion, the Rebbe had shown signs of improvement, which enabled a wedding of two Modzitz families to take place last night. After that, his condition worsened and he passed away. CIRCUS TENT - "The Chassidic Niggun as Sung by the Chassidim"
Our friend Hirschel Tzig at his Circus Tent has a post about a new recording of "The Chassidic Niggun as Sung by the Chassidim," with several RealAudio links including niggunim of Rizhin, Vizhnitz, Chabad and a niggun of the Maggid of Mezritch known to [and probably sung by] Breslov Chassidim. Enjoy! Today, 17 Sivan, is the yahrzeit of Rebbe Aharon of Karlin, son of Rebbe Asher of Stolin and grandson of Rebbe Aharon HaGadol (the Great) of Karlin, who is also known as the Second Rebbe Aharon. When he was only 26 years old he was chosen as Karliner Rebbe. With prodigious scholarship in Torah, and unparalleled piety and humility, he led the Karlin Chassidim; he attracted tens of thousands of followers who eagerly thronged around him, seeking the blessings of a man who was said to be endowed with ruach hakodesh (the spirit of holiness). Some even claimed that he had the soul of King David. The period of Rebbe Aharon's leadership included the dark days of the reign of Czar Nikolai I [see below], but Rebbe Aharon knew how to cheer up his Chassidim and help them to bear their heavy burdens. However, some powerful residents of Karlin objected to the extent to which song and dance permeated the Rebbe's "Court," and in 1864, the Rebbe himself was run out of town. He resettled in Stolin, and since then, this dynasty has been known as "Karlin-Stolin." 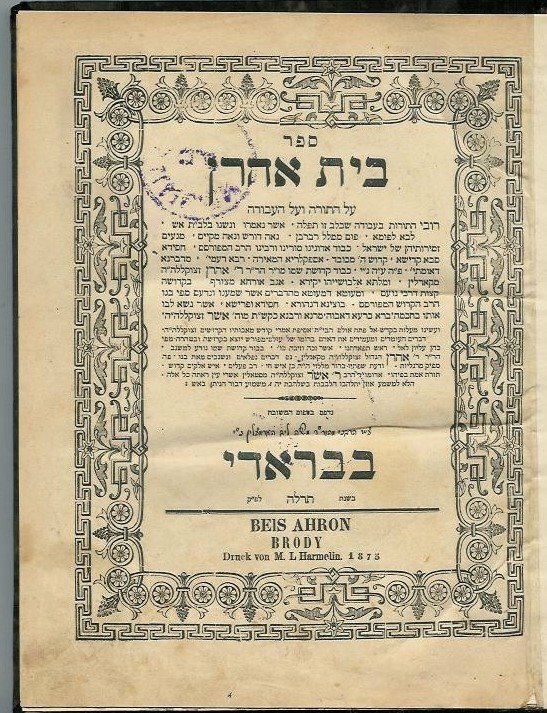 Rebbe Aharon the Second (so called to distinguish him from his grandfather, Rebbe Aharon the Great), was born, according to a family tradition, on Rosh Chodesh Sivan, 1802. 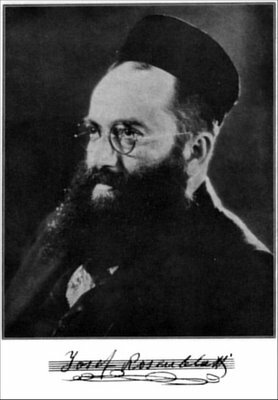 Rebbe Aharon was the recognized leader of the Karliner Chassidim for nearly fifty years. A gifted organizer, Rebbe Aharon applied himself to strengthening the bonds between himself and his followers. To this end, he used to pay them frequent visits in their towns and welcome them most warmly in his court in Karlin. He also had a striking natural simplicity and sense of humor, and regularly made jokes in the Russian vernacular even while teaching his Chassidim at his table. He mixed freely with people of all kinds, and his confident and imposing presence was admired even in non-Chassidic circles. Rebbe Aharon would be sitting clothed all in white, as was his custom on Shabboses and Festivals, at the head of the long table that stood in the large courtyard next to his prayer-house. Tens of canopies stretched above the court hardly sufficed as shelter for the crowds of Chassidim that came to their Rebbe for Simchas Torah. When, at the Ma’ariv [evening] service, Rebbe Aharon himself led the prayers, the worshippers were carried away by spiritual ecstasy, and the 'circuits' of the scrolls were performed in a frenzy of jubilation that rose ever higher, circuit by circuit, song by song, and dance by dance, as the wine flowed freely. 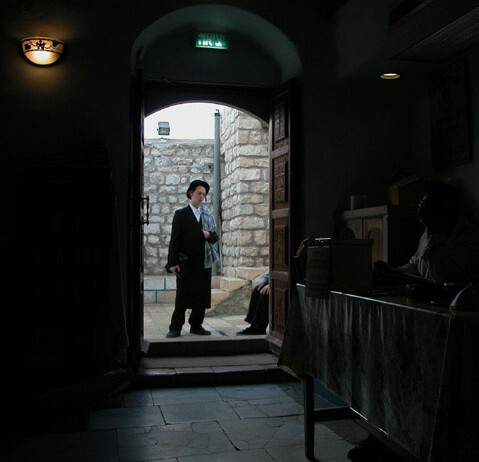 Thus transported, the Chassidim would spend the whole night singing and dancing in the courtyard and the nearby streets. Out of this fervent rejoicing were born many of the Karlin melodies that subsequently became famous in Chassidic circles and even throughout Jewry. Nor was this the case only at Simchas Torah. Every Festival had its own melodies. Outstanding amongst these were the tunes of the Pesach Seder night of which, according to the Chassidim, Rebbe Aharon used to say: 'In my Pesach melodies, there is not one crumb of chametz [leaven].' 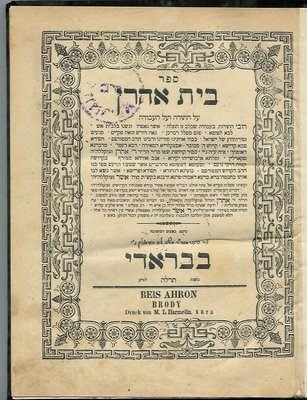 In addition to songs and dances, Rebbe Aharon introduced instrumental music and had two orchestras -- one of them made up of his followers from Volhynia -- which used to play at Melave Malka [the Motzaei Shabbos meal], on the intermediate days of Sukkos and on similar occasions. During these visits to the Rebbe's 'court,' the Chassid would forget the bitter, dreary, care-ridden reality of his daily life and find a refuge for his tired body and weary spirit. Freed for a while of his cares by the general rejoicing, he would be uplifted into a state of self-forgetfulness. This spiritual exaltation and tense expectancy reached their climax on Rosh Hashana before the blowing of the shofar, when Rebbe Aharon, having purified himself in the mikveh and carrying three or four shofars, thrust into the silver gartel encircling his white kittel, would make his way through the throng of worshippers to the pulpit, where, after fervently reciting the forty-seventh Psalm ['To the sons of Korach'], he would perform the commandment of 'hearing the sound of the shofar' – 'hearing is in the heart,' as he preached in one of his sermons on Rosh Hashana. On one of his shofars the words 'Hashem has gone up with a trumpet blast' were engraved. Rebbe Aharon of Karlin said, "I wish I could love a good Jew as much as Hashem loves a wicked one." I don’t know if the following story is about the Second Rebbe Aharon, but it certainly could be. It is from the Chabad website. Another Karliner story is here and here you can find Reb Shlomo Carlebach’s famous Karliner Mincha story. A Chassid came to see the Karliner Rebbe because he was depressed. "I don't know what to do," he said, "I'm not a good Jew, I don’t study enough, I don’t know enough, all I do is work, work, work. But I want to study more. Rebbe, I have a question. What do our great and holy rabbis study on Friday night?" "Well," said the Karliner, "some study Kabbalah." "Oh," said the Chassid, "that is not for me." "No," said the Karliner, "that is not for everybody. But I am sure you study Talmud regularly? How does it go?" "Rebbe, I am ashamed to admit it, I do not study Talmud regularly. You see, I grew up poor. I had to work from an early age to help out my family. I did not get much of an education. I find the Talmud very difficult." "And if you study together with a friend?" asked the Karliner. "My friends also work very hard, they don’t know much either. Besides, I have no time to sit in the study hall for hours. What else can I do?" "Working hard for your family is a mitzva," said the Karliner. "You can study the weekly Torah reading with Rashi's commentary and with Midrashim." "Oh no," said the man, "I always found Rashi very difficult. As I told you, I hardly got an education. I struggle through the parsha each week, but it doesn't uplift me. I am a failure. Besides, I am really not a scholar. I prefer to work with my hands. My family is big, I work long hours." "No Jew is a failure," said the Karliner sternly. "Every Jew can learn. And every Jew should learn. I know something for you. You certainly will enjoy telling beautiful stories about our great sages and tzaddikim (righteous people) with your friends and with your family!" "I am bad at telling stories," objected said the Chassid. "I always forget the important points, I mix them up and I am not a good talker either. Please, I can't do that..."
The Karliner leaned back in his chair. He closed his eyes and he began to hum. He hummed and he swayed back and forth and the Chassid listened in amazement. This was beautiful. What a melody! And he began to sing along. He never had felt so wonderful before, so close to G-d.
After a long time the singing stopped. The Karliner opened his eyes and looked at the Chassid intently. "Rebbe," the Chassid exclaimed, "I understand. Oh yes, I do! I don't feel depressed any more. Thank you, thank you!" And he went home and every Shabbat he sang the most beautiful niggunim. But most of all he loved the niggun of the Karliner Rebbe. And he did not feel depressed anymore. Niggun Rikud Stolin; Ma Yedidus; Yichadsheihu; Niggun Rikud Motzei Shabbos; March Menucha Vesimcha; Niggun Rikud Wedding; Bar Yochai; Niggun Ka Echsof; March Menucha Vesimcha; and Davka. It should be noted that the words to Kah Echsof were composed by Rebbe Aharon HaGadol of Karlin. In addition to Karlin, other Chassidic groups such as Belz [8th track] have composed their own melodies for it; it is sung by just about all Chassidim. Zechuso yagein aleinu, v'al kol Yisrael! "So…at around 3 am, I arrived at my friend’s house, and knocked on his door." With Shavuos coming, besides all the wonderful Torah-related niggunim I could blog about, and the Ne’im Zemiros Yisrael, David HaMelech, and the Baal Shem Tov’s yahrzeit, I thought I’d share a personal story about Shavuos, Modzitz and myself. For a more detailed description of Akdamus, with much of the material adapted, with permission, from "Sefer HaToda'ah," by Rabbi Eliyahu Kitov, see the OU website. This also includes a partial translation of the poem. *From Rebbe Nachman’s wisdom, Sichas HaRan, #256. “The Rebbe highly praised the Akdamus song, chanted before the Torah reading on Shavuos. He said, 'The Jews are so accustomed to good they do not realize the greatness of the Akdamus poem. If you know the high level of the Akdamus, as well as that of its customary melody, then you know what a wondrously unique song it is. The Rebbe then chanted a few lines of the Akdamus. He then said, 'Akdamus is a song of cheshek –a song of love and devotion. See the story The Burgher and the Pauper, the tenth story in Sippurei Ma'asiot, which discusses the song of cheshek. Perhaps the most famous of these operas is the “Ezkera HaGadol,” which we described earlier. The Akdamus niggun is another ‘opera,’ and a very moving piece. But first, here’s my story. MANY years ago, it had just become both ‘in vogue’ and available for women to give birth using ‘natural childbirth’ methods, even in the hospital. When my wife was expecting our first child, she decided she wanted to do this. At that time the only hospital in Brooklyn, where we lived, that offered this method was Brookdale Medical Hospital, not far from Crown Heights. And so it was on Shavuos night that my daughter decided to make her appearance in this world. My wife was kind enough to let us [myself and some friends, who were our guests] finish our Yom Tov meal, and then it was time to head for the hospital. Summoning a taxi in the Boro Park section of Brooklyn was no simple matter – especially if you wanted the driver to be non-Jewish. My friends quickly summoned a cab with a Chinese-American driver, and off we went. Well, at about 2 am my daughter was born [Mazel Tov! ]; my wife wanted to go to sleep, and me? Well, I needed to find a place to be. Not knowing when this was going to take place, I made absolutely no arrangements in advance. What was I to do? Well, Baruch Hashem I had some good friends in Crown Heights, and decided to walk to that neighborhood, which I mentioned, was not too far away. I was fortunate to remember my friend’s address, and it was also auspicious that it was Shavuos night, when many Jews stay up through the night learning Torah. So…at around 3 am, I arrived at my friend’s house, and knocked on his door. “Yitz, what are you doing here at this hour?” my friend asked. Simple as that. Except – I too was tired, and I knew that my friend, who was a Lubavitch [Chabad] Chassid, was going to daven in 770 [Eastern Parkway], and that they daven at their regular time – beginning at something like 9:30 or 10 am. “Maybe you know of a Shul where they daven at Netz [sunrise]?” I asked. Well, that was certainly a pleasant surprise! At that point, I had heard some Modzitzer music on a few records, but had never davened with them; and of course, I had never heard the more lofty [and lengthy] compositions. The davening was just beautiful! Shavuos that year was like this year – on Friday and Shabbos. On Shabbos in Modzitz, besides Keil Adon and Mimkomcha for Kedusha, they sing the entire section that follows Barchu – HaKol Yoducha – to a lengthy ‘Tish’ niggun. And of course, Hallel is sung on both days of Yom Tov. But if I was at ‘cruising altitude’ by the time Hallel was over, my neshama soared to the heavens before Kriyas HaTorah – the Torah reading. For on Shavuos, this is preceded by Akdamus, which in Modzitz, is preceded by…the Akdamus niggun. I was taken totally by surprise. This wordless melody, as I mentioned, is symphonic in nature. It begins as a rousing march, and just seems to go on and on. As with many marches in Modzitz, it conveys a regal feeling. The middle section becomes more ‘dveykusdik’, imparting a feel of attachment to Hashem. This part also becomes more ‘operatic’ in nature, and requires a skilled singer to execute it properly. Towards the end, it again becomes ‘up-tempo’ and more joyous. Besides on Shavuos, the niggun is often sung on the Yahrzeit Tish or seuda of the Divrei Yisrael. It is told that this is one of the niggunim that the Divrei Yisrael asked his son, the Imrei Shaul, to sing at his bedside before he was niftar [passed away]. Two years later…and on Shabbos, the fourth of Sivan, my wife goes into labor. We drop my two-year-old daughter at a babysitting service, and head for Brookdale Hospital. While religious Jews are enjoying their Shalosh Seudos, the third Shabbos meal, my wife gives birth to a boy. We ask a shaila [a Halachic inquiry] and discover that officially, my son’s birthday is 5 Sivan, and the bris would be on the following Sunday. “Hey, I was wondering, could I spend Shavuos again with you guys this year?” I ask. “What else could it be?” he answers. This time, I had no questions about where I was going to daven. So, after having heard the rousing Akdamus niggun twice in three years, my connection to Modzitz grew. When my son was a year old, we moved to Flatbush, Brooklyn, only to discover that down the street from us was a Modzitzer Shtibel, whose baal tefilla was…R. Ben Zion Shenker! And when we came on Aliya a few years later, our downstairs neighbor was a Modzitzer Chassid, with whom we enjoyed going to the Rebbe’s Tishes together! A wonderful Chag HaShavuos to all!! !